red and black angled UNI stage pod air filter for 24mm mikuni flat slide, 28mm mikuni flat slide and vm26 mikuni round slide or any other carbs with 44mm OD filter mounts. 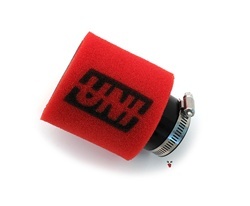 "uni has been manufacturing the best air filters on earth for over 30 years. uni's provide increased performance, higher air flow and better engine protection than any other air filter. And they can be cleaned and reused. Be sure to use uni foam filter oil for proper filtration." taco eater : J Mead from Home of the Antisocialites - South Bend Indiana! bought this on accident while not reading and when I got it realized it was too big, however if you give it some extra tightening it fits snug on the 22mm round slide mikuni's. had this filter come with my moped. it catches your eye and works good too. well it, filters air, and it's good at that, just like any other foam filter. yep. just get it. copyright © treats hq inc all rights reserved!